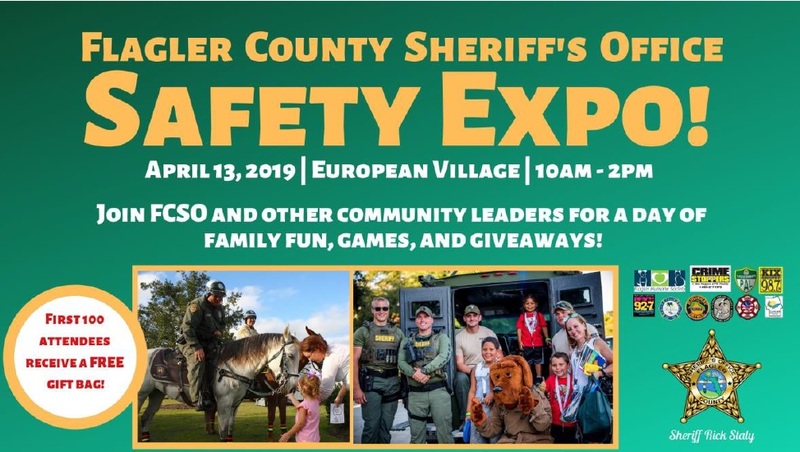 The Flagler County Sheriff's Office (FCSO) will be hosting its first ever annual Safety Expo on Saturday, April 13th from 10 a.m. to 2 p.m. at the European Village in Palm Coast. This event helps ensure that residents have the information and resources to stay safe and avoid becoming a victim of crime. This event is FREE to the public and will include child fingerprinting, emergency response vehicles to explore, the FCSO SWAT, K9, and Marine Units, resource booths and static displays from community partners, and plenty of fun activities for the kids provided from the Flagler Sheriff's Police Athletic League. Also making a debut at the Safety Expo is FCSO's "Shoot or Don't Shoot" simulator. This high-tech target simulation will allow visitors to train like the pros and see firsthand what it's like to be a deputy having to make split-second decisions in a safe and controlled environment. The first 100 attendess will receive free gift bags loaded with valuable safety information and goodies. But even if you are not among the very first to arrive - stick around! Sheriff Rick Staly will be hosting an hourly live version of the popular FCSO internet series "Fugitive Friday Bingo" on the European Village center-stage. Winners of this version of the bingo game will NOT be taken to the Green Roof Inn, but instead will be rewarded with a FREE Ring video doorbell! "We are so excited to be able to bring this Safety Expo to the community," Sheriff Staly said. "Not only will you get to know your Sheriff's Office better, but many of our partners in safety will be there as well to showcase all of the ways we work together to keep Flagler County safe and serve the community. I hope that everyone will come out and join us for a day of fun, games, education and giveaways all in the name of staying safe!" Partnerships with the community in guardianship policing crime prevention is critical to our crime reduction strategy. The FCSO Safety Expo will be full of information and fun for the whole family. We hope to see you there!